Mossburn Distillers & Blenders, the company behind the new Torabhaig distillery on Skye, has released a new range of blended malts created using bespoke cask bills. The Mossburn Signature Casks Series showcases the typical flavours of Scotland’s traditional whisky regions, through the use of specially coopered ‘Mossburn Casks’, built to accentuate certain characteristics in the whisky. The first two whiskies in the range are an Island and Speyside blended malt, both of which are bottled at 46% abv without colouring or chill filtration. The Mossburn Island Blended Malt features a number of malt whiskies distilled on the Scottish isles, that were matured in refill American oak and then finished in first-fill ex-Bourbon casks with toasted virgin European oak heads ‘to provide additional smoky spice’. 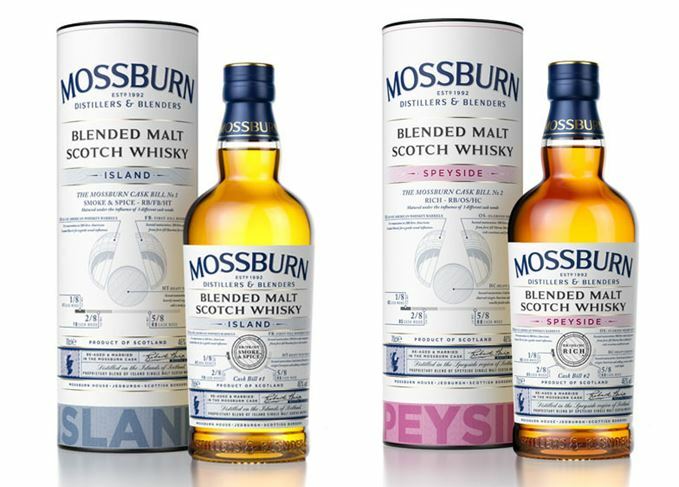 The Mossburn Speyside Blended Malt combines mature malt whiskies from a number of Speyside distilleries that were also matured in refill American oak and then finished in oloroso Sherry butts with heavily charred virgin American oak heads, which ‘enhance the richness, depth and spicy vanilla flavours’. The Island edition will be available for around £40 for a 70cl bottle, with the Speyside edition available for around £44. Mossburn, which as well as operating Torabhaig distillery on Skye is also in the process of building two distilleries at Jedburgh in the Borders, has also developed a range of independently bottled single malts under the Vintage Casks range. Initially comprised of seven bottlings, the expressions include 2007 vintages from Linkwood, Inchgower, Blair Athol, Teaninich and Craigellachie, plus 2008 vintages from Ardmore and Miltonduff, all of which have been maturing in Mossburns warehouses. With 10 whisky distilleries opening this year, Scotch is on track for unprecedented growth.